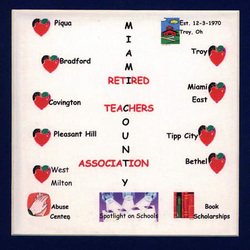 Miami County Retired Teachers Association held its first meeting on December 3, 1970 in Troy, OH at the First National Bank in the Heritage Room on W. Main Street. In October 1978, MCRTA changed its meeting place to Terry's Cafeteria in Piqua. In 2001 MCRTA reconstituted itself and became one of the fastest growing chapters in the state. Among its service projects, MCRTA presents four $250 Book Scholarships to deserving Miani County students. It also makes various contributions to the Miami County Family Abuse Shelter. At regular meetings, the chapter Spotlights County School Systems by inviting Superintendents to speak about their schools. Many guest speakers from ORTA and STRS are featured to help keep the membership informed about retiree issues and health concerns. But this is a fun-loving group. We enjoy many good local entertainment groups from the community and the schools. In September 2006, MCRTA sponsored a Vendor/Service Organization Fair featuring Miami County and ORTA Vendors. This was an overwhelming success for MCRTA and allowed members to gain useful information as well as having the opportunity to volunteer with the various service organizations. Currently MCRTA holds its regular meetings at the First Church of the Nazarene in Troy OH.